Savannah is considered a Southern treasure, a city of beauty with a rich, colorful past. Some might even call it magical . . .To the uninitiated, Savannah shows only her bright face and genteel manner. Those who know her well, though, can see beyond her colonial trappings and small-city charm to a world where witchcraft is respected, Hoodoo is feared, and spirits linger. Mercy Taylor is all too familiar with the supernatural side of Savannah, being a member of the most powerful family of witches in the South. Despite being powerless herself, of course. Having grown up without magic of her own, in the shadow of her talented and charismatic twin sister, Mercy has always thought herself content. But when a series of mishaps—culminating in the death of the Taylor matriarch—leaves a vacuum in the mystical underpinnings of Savannah, she finds herself thrust into a mystery that could shake her family apart . . . and unleash a darkness the line of Taylor witches has been keeping at bay for generations. In The Line, the first book of the Witching Savannah series, J.D. Horn weaves magic, romance, and betrayal into a captivating Southern Gothic fantasy with a contemporary flare. I have to say, this is the first book I’ve read in quite a while that has left me completely satisfied. I liked the main character, Mercy, right from the beginning, and that is always a great sign. The first chapter pulled me in, but as the novel revealed more about the people in Mercy’s life, I absolutely couldn’t put it down. Mercy is about to be 21, and a member of Savannah’s well known witch family. But, much to her family’s chagrin, Mercy was somehow born without any of the powers that everyone else possesses. To make things worse, her twin sister Maisie is the most powerful witch the Taylor family has seen in ages. And it’s a good thing too–because the head of the Taylor family has just been found murdered. As if this weren’t enough, Mercy finds herself caught in a love web of sorts: she is dating Peter but in love with her sister’s boyfriend, who seems to have feelings for her as well. This whole amalgamation gets to be too much for Mercy to handle, so she foolishly goes to a false witch who has been her family’s enemy for generations to try to get some help. Soon all the lies that have devised Mercy’s life thus far start tumbling down. In the beginning chapters, things took off quickly and spiraled from there. I usually don’t like a main character that is helpless, but in this instance, Mercy has an excuse. Literally everyone she knows can use magic against her, while she has none to defend herself with. Still, she handles things as best she can, even though she makes some bad decisions. Not only was this a murder mystery, but it was a superb paranormal story as well. The reader gets to know several members of the Taylor family and their powers very well. Each one has some personal demons, and each one has lied to Mercy, though they say it’s for her own good. Though the pages mentions such creatures as golems, elementals, and hoodoo witches, I was never confused or had trouble understanding what was going on. I wish I could say more about why I loved this book, but I would be giving away some big twists–and believe me, there are many! More than once my jaw dropped at the secrets that had been revealed. Even as I was making notes in my head about negative things I would point out in my review, they all eventually came to be explained away through the plot, and I was left very happy with the way things ended. The author does a marvelous job putting you right in the midst of the city of Savannah. As a matter of fact, the entire environment that he creates is mystical and rich. I have never been to the city, but now I want to go! I would recommend this book to anyone who wants a new twist on witch novels, or just paranormal in general. I am not sure why the author would want to make this a series, as I felt it ended well, but if so I’ll be right there to read the next book! J. D. Horn was raised in rural Tennessee, and has since carried a bit of its red clay in him while traveling the world, from Hollywood, to Paris, to Tokyo. He studied comparative literature as an undergrad, focusing on French and Russian in particular. 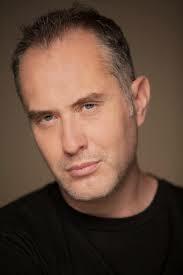 He also holds an MBA in international business and worked as a financial analyst before becoming a novelist. When not writing he is likely running, and he has race bibs from two full marathons and about thirty half marathons. He and his spouse, Rich, and their three pets split their time between Portland, Oregon and San Francisco. 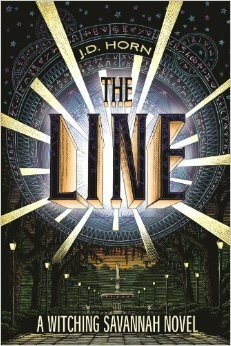 One commenter will win a paperback copy of The Line! Let me know if you’ve ever been to Savannah, Georgia! Posted on March 7, 2014, in book tour, books, free, Giveaway, reading, review. Bookmark the permalink. 6 Comments. I have never been to Savannah, Georgia. Thanks for this great giveaway. Never been to Savannah, Ga but all over the SC coast. “completely satisfied” is a great feeling, isn’t it?! Kudos to the author for making you feel that way at the end of this book! I lived in Georgia until I was 8, and I remember going to Savannah a few times when I was younger. It is a gorgeous place! NOW I want to go and see if I can find some witchery and hoodoo! Thank you so much for the giveway~!